Hints of spring may have you in the mood to get crafty, but the thought of your kids getting paint, glue and glitter on anything standing still doesn’t have to keep you from creating spring crafts. From paint-splattered murals to packing peanut art, these four messy outdoor crafts for kids will inspire creativity while keeping your indoors clean. Rubber spiked balls plus paint and some eager little hands equal monster-sized fun! Secure several lengths of paper to your fence with pushpins and spread drop cloth below. Cover rubber ball in paint by dipping into disposable container and stand back! Let kids toss the ball at the paper to make a monster-shaped splatter. Once paint is dry, your youngsters can use markers and googly eyes to turn this messy outdoor craft into a mural to welcome all of spring’s creatures! Let kids make all the mess they want outdoors with this life-sized stamper that works great on canvas tote bags and aprons, too. Adhere foam shapes to the mailing tube, leaving about six inches uncovered on each end for your kids’ hands to roll. Use the foam brush to apply paint to the foam shapes and clean off excess from roll. Lay fabric or sheet of paper on a flat surface and roll and press the tube along the length of the paper. Let dry and use another paint color to add to the pizzazz of this outdoor craft for kids! 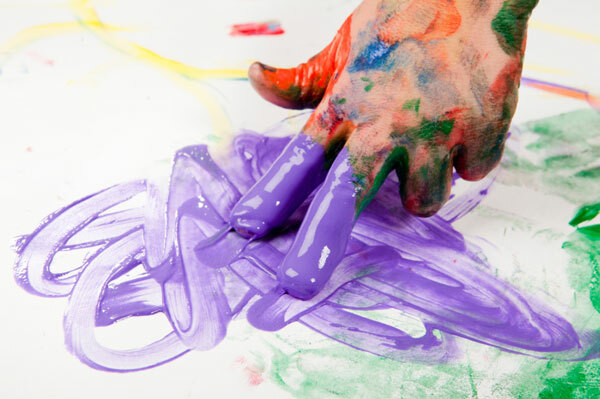 Messy pop-art crafts for kids are the perfect way to welcome spring. Crafts like these can’t be done anywhere else! Spread a large sheet of paper on the ground. Scoop one tablespoon of baking soda into the center of a square of toilet paper, fold into a bundle and tuck into one corner of the sandwich bag. Mix one-third cup of vinegar with one tablespoon of paint color of your choice and pour into opposite corner of the bag. Seal the sandwich bag quickly, with a little air inside, and mix by shaking slightly and set on the paper. But, stand back! The bag will inflate and the pop, leaving a masterpiece fit only for the outdoors. Once spring has sprung, it’s warm enough to head outside and engage in a little water play, but be sure kids use just a splash or you’ll be left with a mushy mess. Roll up your kiddo’s sleeves and dip the sponge in water. Press two packing peanuts on the wet sponge to dampen and press together. Continue wetting peanuts and adding to the sculpture. Let dry. Your kids can make art, hats or whatever their imagination desires to welcome the new season with this outdoor-worthy craft! When spring showers have your youngsters cooped up inside, consider moving these four messy outdoor crafts to a covered porch or screened patio. Just be sure to have an extra drop cloth or two on hand to make them even easier to clean up, whether the sun is shining or the rain is falling down!